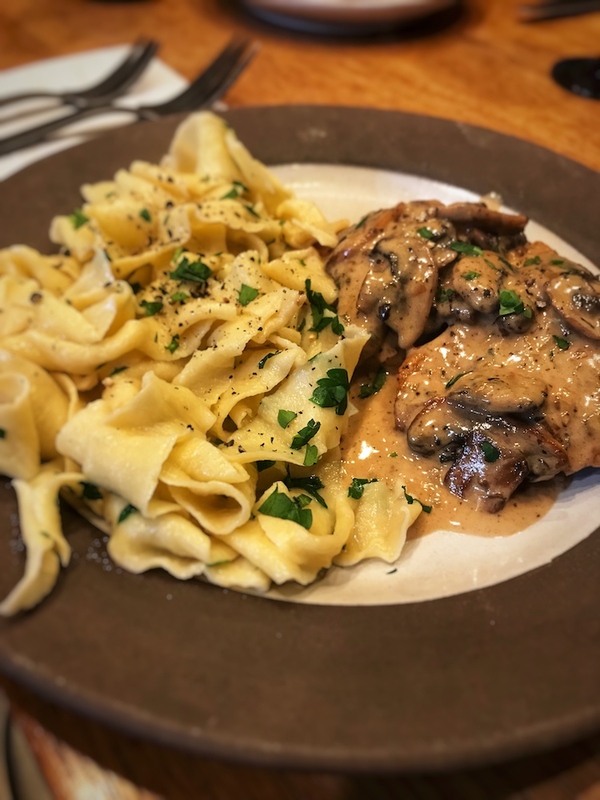 Chicken Marsala – Damn Life is Good! There is just something so comforting and flavorful about a great Chicken Marsala recipe – rich, deep flavors that can be a feast for the eyes as well. Marsala sauces utilize Marsala wine, which is a sweet fortified wine from Sicily (other fortified wines are Sherry and Port). If you can, use an actual Sicilian Marsala, but if you can’t find one (or don’t use it often enough), you can find Holland House Cooking Marsala in most grocery stores. This recipe makes 2-4 portions (depending on how hungry you are). To get a really rich sauce, we need to intensify some flavors – take your chicken stock and put it into a saucepan on medium-high heat and reduce it down to about 3/4 of a cup. Chicken Marsala uses thin chicken breasts – you can either get your breasts thin by pounding them out with a meat tenderizer or cutting the filets thin. We opt for cutting them thin, because I don’t want to break down the muscle fibers. We cut ours about 3/8″ thick. We also cut the breasts into two smaller fillets each – it’s easier to cook and portion that way. Pat the filets dry and season with salt and set aside. Protip: Keep a heavy duty frozen baggie of “chicken pieces” in your freezer. When you trim your fillets, dice up the leftover pieces and toss them in your baggie. When you get enough in there, you’ve got the protein ready to go for a great chicken stir-fry! You’ll need two 10″ (or thereabouts) non-stick frying pans for this recipe. Put the first one on medium high heat and melt 3 T of butter. Add the shallots and sauté for a minute or two. Next, add the mushroom slices and 1 t of fresh sage. Season with salt and pepper. Stir to get the butter coated all over the mushrooms and then leave alone for a few minutes. The mushrooms will absorb the butter, then weep out some moisture and then they’ll begin to brown. Once they brown, flip the ‘shrooms and brown the other side, then remove from the heat. Put the flour into a shallow bowl or plate and season with salt and pepper (we also add in a dash of cayenne as well). Dredge the chicken fillets in the flour and shake off the extra and set aside. Heat the second frying pan over high heat and add 1 T of butter and 1 T of EVOO. Get it nice and hot and add the chicken (it should sizzle when it hits the fat). Depending on the size of your fillets (and pan), you may need to do this in several batches. Cook for 4-5 minutes total, flipping once – you should get a nice golden color. Place the cooked fillets on a plate and keep warm (foil, in a warming drawer or in your oven turned down low). Add the Marsala wine to the pan you cooked the chicken in and deglaze the pan, stirring up all the brown bits on the bottom. Keeping it at high heat, add in the reduced chicken stock, heavy cream and the mushroom mixture. Let cook and bubble, stirring continuously, until it starts to thicken. When the sauce is a good consistency, reduce the heat to low and add in about 2 T more of Marsala, the lemon juice and the remaining 1 T of sage. Stir and taste and season with salt and pepper to taste. Place the fillets on your serving plates and top with the Marsala mushroom sauce and be prepared for some amazing, rich flavors! We serve this with a side of fresh-made pappardella pasta tossed with butter and chopped parsley, finished with a little fresh cracked pepper.